Yesterday, we drove to the Brookline Winter Farmers Market located in the Arcade building (318 Harvard Street). It’s a small, but effective market. A little bit of everything you need. The vendors I noticed were two veggie farms, a hydroponic farm, a meat farm, a seafood vendor, plus bread, cupcakes and popovers. The reason we went in the first place, was to meet Liz from Four Star Farms to purchase their fresh-ground wheat and barley flours. 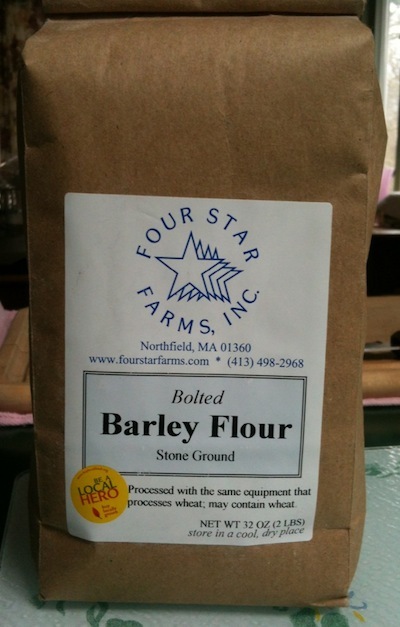 I haven’t used the flour yet, but I’m really happy that I found a local grain grower! It’s not something that a lot of farms grown in the New England area. The farm grows wheat, triticale, spelt, barley, buckwheat, and corn, and they sell as both whole and flour. I can envision white food buckets in our workroom filled with whole grains, ready to be freshly ground in my soon-to-come grain mill. It was kind of a pain to drive from our area, but if we lived closer, I would absolutely go all the time. There is a public parking lot in back of the Arcade building with free Sunday parking (normally metered) and there is a Trader Joe’s within walking distance, among other shops. I borrowed The Sprouted Kitchen: A Tastier Take on Whole Foods from the library and I’m loving this book! I hope I have time to write a complete review, but until then, I wanted to blog the details of her cornmeal cakes recipe. I made a batch this morning and was extremely impressed. Pancakes are hit or miss with me, usually because I wing it and don’t follow a specific recipe! This time, I followed her directions, well, up to a point. I still put my own spin on the ingredients, but it worked beautifully. Her original cornmeal cakes recipe also includes cherry compote, but we topped with some of my own homemade Concord grape syrup instead. Add cornmeal to large bowl, then stir in oil and boiling water. Allow to rest for 5 minutes to soften cornmeal. Add chia seeds, yogurt liquid and egg to the cornmeal mixture and mix until blended. Pour the dry flour mix into the cornmeal mixture and stir carefully until blended. Cook pancakes over medium heat in cast iron pan or griddle, adding 1/2 tsp of coconut oil to the pan for each batch. Blending the cornmeal with the liquids beforehand seemed to make it a lot easier to blend in the flour. Sometimes I feel like I’m over mixing. Sara’s original recipe included honey and sugar, but I don’t like adding any sweetener to pancakes since we always top with sweet syrup of some sort. Truthfully, even plain, these pancakes were really delicious! I didn’t miss the extra sugar at all! Anyway, I replaced 2 Tbsp honey with more boiling water. If you want to go by her original recipe, add 2 Tbsp honey with the cornmeal, olive oil, and boiling water, and 3 Tbsp of natural sugar to the dry flour ingredients. Sara made her pancakes with 3/4 cup buttermilk. I had plain yogurt on hand, so I mixed 1/4 cup with 3/4 cup of water, making a full cup of liquid which was 1/4 cup more liquid than the original recipe. I like a really thin batter, and the consistency of this was perfect for me. The original recipe used all butter, but I replaced with olive oil and coconut oil. The chia seeds were my idea. I love adding seeds to pancakes! I will definitely make these pancakes again. 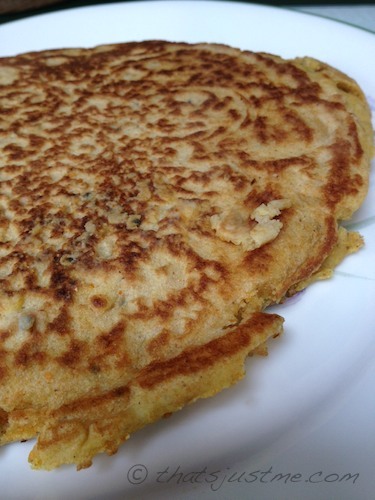 I love the taste of corn pancakes, and next time I’m thinking 1/2 cup of shredded coconut might be a nice addition. Yum! This recipe is slightly inspired from the Cornbread Muffins recipe found on page 124 in the Power Food Cookbook by Rachael Anne Hill and Tamsin Burnett-Hall. I used their recipe as a base, but put my own spin on the ingredients according to what I had on hand. It’s all about adapting to your own pantry! The original recipe included chili peppers and corn! I still have a stock of frozen chile peppers from the summer CSA and there was a half bag of Trader Joe’s frozen organic corn. The original recipe called for 2 Tbsp of baking powder, and in my opinion, that is just way too much, so I cut it in half. Whisk the powdered flours, baking powder, salt and powdered buttermilk in a large mixing bowl. In large glass measuring cup, melt honey in about 1/2 cup of hot water and stir; once honey is completely dissolved, add the rest of the water to equal 1-1/3 cups liquid. Whisk in egg, and oil, then pour liquids into dry ingredients. Stir together until just mixed. Spoon into muffin tins, then bake in preheated 360F oven for 15-20 minutes until risen, firm, and lightly browned. Transfer muffins to cooling rack. I thought these muffins were delicious. I loved the texture of the corn kernels, and the chile peppers didn’t add heat, but did add yummy flavor. 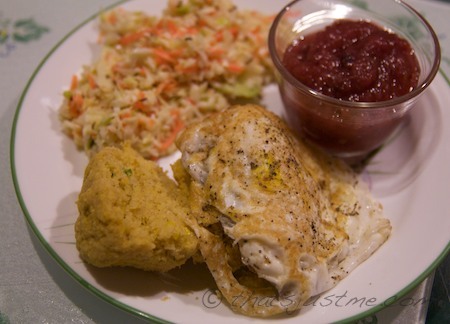 They were delicious for dinner, paired with a fried egg and sides of homemade cole slaw & cranberry sauce. I’ve been reading the Eating Rules blog trying to organize my pantry and fridge for the upcoming challenge to give up all processed foods for the month of October. So here are a few of my challenges and concessions. So many natural brands contain either soy lecithin, sugar or both. I’ve been working on finding an alternative. We enjoy a small bit of chocolate as a snack a few times a week, so I don’t want to spend a fortune on a $10 bar of chocolate that won’t last very long. I found a homemade powerballs recipe on the 100 Days of Real Food web site and I just made a batch this afternoon. I pressed them into a square glass baking dish and they’re in the fridge now. I figure I can get 16 servings/pieces, and then we can add more nuts on top when we’re eating them. We’ll see how it goes. If it’s not acceptable, I will cut back but will not compromise our chocolate needs. I will just find a brand that doesn’t use soy lecithin, and doesn’t cost a fortune, but we’ll have to make an exception for any added cane sugar. I’m a big fan of Crofters. It’s really low in sugar and the ingredients are organic. I buy the premium spreads which contain fruit as the first ingredient as opposed to their Just Fruit product which contains grape juice as the first ingredient. The problem is “sugar” as in processed white sugar isn’t allowed according to the “rules” and the “premium spread” jellies contain organic cane sugar. Since this brand is not inexpensive to buy, I don’t want to pay for fruit juice, so I will not be giving up my Crofters spread for October. Note: As I’ve been reading more and more comments over on the Eating Rules blog, I’m getting the feeling that some participants are a bit over the top. I’m don’t plan to be as strict & rigid, and that’s okay. I have an opened carton of the unsweetened milk in the fridge. It doesn’t pass the test for unprocessed because it contains guar gum and carrageenan, ingredients I wouldn’t expect to see in my own kitchen. Plus they enrich with vitamins and minerals. But since I opened the carton before I took the pledge, I will continue to use the coconut milk until it’s finished, and I won’t use it again until after October, if at all. I use So Delicious for baking and a tiny bit for my oatmeal, but I might consider a permanent switch to another kind of milk instead. Or maybe even a fresh non-homogenized dairy milk. 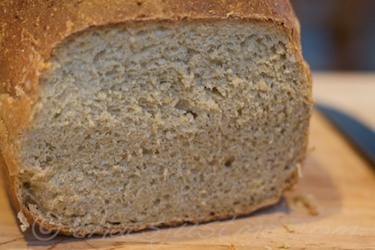 I will still continue to use white flour – unbleached and un-enriched from King Arthur, but I will make a conscious effort to use more whole grain flours when baking bread, the way I used to when I first started baking. I’ve become a bit lax on that lately, adding up to half white flour. I’ll keep experimenting with barley, corn and rye flours as well as whole wheat. Oh and I’ll be also using vital wheat gluten. I don’t think many of the big chain restaurants will qualify for unprocessed, even Chipotle Mexican Grill probably has something that breaks the rules by using sugar, soy, etc. It was suggested on the blog to try local restaurants instead, but I’m not that sure they would be any better. Even if a restaurant boasts homemade food, how truly homemade is it. I’m sure there is some sort of processed ingredient, like soy sauce (not naturally made) or refined sugar. So, I have to decide. Do I give myself one day a week to treat myself to a restaurant meal, as long as the meal is presumed to be fairly unprocessed? For instance, steamed chicken and veggies at the Asian restaurant or meat skewers & pork ribs at the Greek restaurant. Yes, I will add this to my list of concessions as well. One day a week, a healthy restaurant meal. NO chain restaurants. Well I think that is all the issues I’ve encountered. I’m going to try to stick to the rules, but I refuse to spend a ton of extra money or waste food. Part of my challenge will be to stick to our budget! Whole Wheat Bread is Full of Sugar! No wonder people on “diets” give up bread! 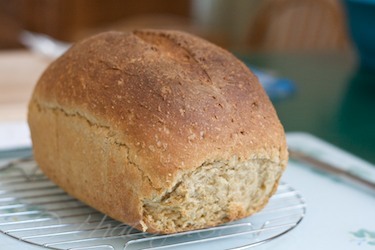 Commercial whole wheat bread is loaded with refined sugar! I only baked two very small loaves of bread for our vacation, so I figured I’d pick up a loaf if needed at the local store while we were away. Stopping at a little local grocery/convenience store, I found many whole grain bread choices, but wow, was it shocking to read labels. They are full of sugar! I ended up with a loaf of Nature’s Pride “Healthy Multi Grain” bread. One slice was 4 grams of sugar! So, for a normal sandwich, that’s 8 grams of sugar! No wonder Americans are so obese! Sugar is hiding in supposedly healthy foods! The fiber grams for one slice is 3g, funny the sugar outweighs the fiber and it’s whole grain! Pretty sad! I’m so glad that I don’t mind baking my own bread, where I can control my own ingredients and indeed make something worthy of the description “healthy” – by the way, an equal serving of my homemade baked bread is 2 grams of sugar, and I could probably even reduce it or even remove sugar altogether if I really wanted. Author debbie @ That's Just MePosted on August 27, 2011 August 31, 2011 Categories FoodTags bread, commercial bread, FOOD, healthy, junk food, sugar, unhealthy, whole grain, whole wheat1 Comment on Whole Wheat Bread is Full of Sugar! Yesterday, I made some fantastic yummy potato eggplant pancakes for dinner. I don’t always go meatless on Meatless Monday, but we do try to eat meatless one or two dinners per week. The main flavor in these pancakes was obviously potato, I purposely used less eggplant because DH isn’t a fan. I wanted to ease him into it. Next time, I will include more eggplant – maybe two smaller ones. I love using the smaller sized ones because there are virtually no seeds, and the peel is tender. These pancakes are really a snap to cook, because the vegetables are roasted ahead of time. Roasted vegetables bring such a wonderful flavor and you can substitute different vegetables in many combinations. Carrots, potatoes, onions. Or how about zucchini, leeks, cauliflower. The possibilities are endless! In baking dish, arrange potatoes, eggplant and onions together and drizzle with olive oil, and season with salt & freshly ground black pepper. Roast vegetables in 350F oven. I like a lower heat, because I have a smaller countertop sized convection oven. It heats up quickly. Others roast vegetables at 400F. Choice is yours! Once vegetables are fork tender, allow to cool for a few minutes, then pour them into food processor. Pulse a few times, then process until fairly chopped and combined. Transfer veggies into large bowl, add eggs and flour, and mix until combined. Using a cast iron pan (or if you prefer non-stick), pour 1 tsp coconut oil and allow to heat. Spoon pancake mixture into pan. I like making two smaller pancakes. You can make one larger pancake. Add 1 tsp oil for each batch. You also might need to wipe out pan if necessary. Serve with salad. 2-3 small pancakes for each person, with leftovers for lunch next day! 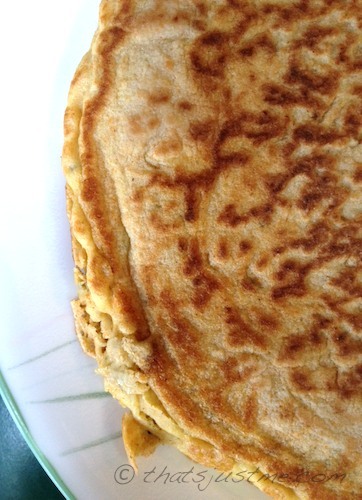 These pancakes really were delicious, and DH thought so too, despite that dreaded eggplant was a hidden ingredient! I will for sure make them again! A few weeks ago, I was wondering if my toast had less calories than bread. I googled, and duh, of course the calories are the same, they are just calculated differently. 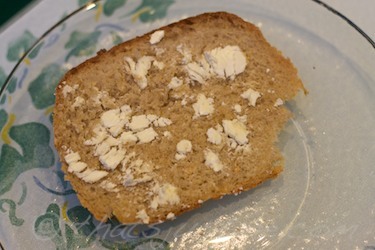 For instance, before toasting, my serving of bread was 2.5 oz, after it’s turned to toast, the weight was reduced to 1.6 oz – no, the calories didn’t disappear, but moisture inside the bread did, taking away a good chunk of its weight. That is a whole ounce difference, which could lead to overeating if you’re not careful to weigh your bread BEFORE toasting it. If you have to weigh bread after toasting, then you would need to calculate the calories as toast NOT bread. 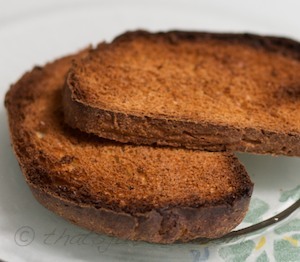 I love toast, it makes day-old bread taste amazing – just make sure not to burn it! It’s always comforting to have pancakes on Sunday morning! 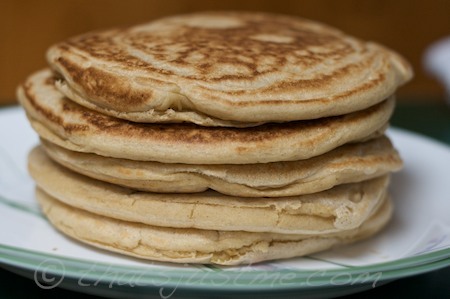 I whipped up a batch of batter using whole wheat & barley flours, So Delicious coconut milk, and olive oil, and while I washed weekend dishes, my lovely DH cooked the pancakes! He made 5 large pancakes. They’re very hearty and healthy, but not something I’d make every day. 1 and 1/2 pancakes filled me up, while DH ate 2 and 1/2 pancakes. I’m happy to have one left over for tomorrow’s breakfast. Whisk all dry ingredients: flours, baking powder, salt, sugar in a medium bowl. Using a large glass measuring cup, measure the coconut milk, then mix in whole egg and olive oil. Pour wet ingredients into dry, and mix until just combined. It’s a thick batter. If you like a thinner batter, add more coconut milk. This is the only time I recommend using a non-stick pan, just because it’s a lot easier and there’s no need for additional oil. Cook pancakes to your desired size and shape. As I said, we made a total of 5 large ones, but you might like smaller or thinner pancakes. I ate them with my fingers, dipping pancake pieces into a small bowl of real maple syrup! Use the nutritional data as a guide; the info is not absolute, your results might vary considerably depending on the total weight of the finished dish. UPDATE: 2011-03-20: Made pancakes again this morning. It’s becoming a nice tradition! I added a little bit of cornmeal to the barley flour, and instead of the non-stick pan, DH used our cast iron, with about 1 tsp of coconut oil. I don’t know if it was the added corn or the cast iron (or both) but these pancakes ROCKED! They had a slight crispy coating (which is probably from the cast iron) and I didn’t even need syrup. I ate them straight! They were delicious! UPDATE: 2011-05-15: Made banana pancakes this morning in the cast iron. Yum. Tweaked the ingredients a little bit. Since I added 2 medium bananas (1 cup), I left out the sugar. I had previously noticed a slight ‘metallic’ taste so today, I tried reducing the baking powder to 2.5 tsp and the pancakes were equally light and fluffy. I also reduced the oil to 2 Tbsp. I haven’t been inspired (or had the time) to make any muffins or quick breads for months. But I’ve been craving desserts, so tonight, I decided to take to heart Michael Pollan’s Food Rule #39: Eat all the junk food you want as long as you cook it yourself. Which muffin recipe to make? I thought about peanut butter chocolate chip, blueberry, and oat raisin, but decided I’d like to try something new. 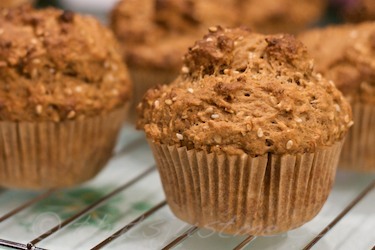 I searched through my Evernote recipes and found a lovely sesame seed muffin recipe. I loved that the recipe included a good amount of sesame seeds, but I wanted more whole grains, so I adapted it to my needs. 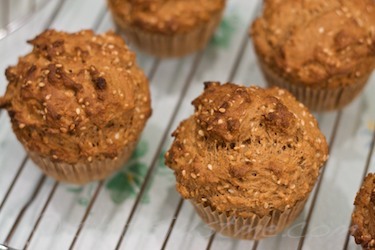 In a large bowl, whisk together whole wheat & rye flours, baking powder, salt, cinnamon, ginger, nutmeg, and sesame seeds. Mix in molasses, milk, and vanilla. Pour wet mixture into dry flour bowl and stir to combine. Try not to over mix. Scoop into 12 muffin tins lined with paper and bake for 14-20 minutes. The mixture is firm, so it’s easy to pile the batter high in the tin. I think I’ll add more spice next time. The cinnamon and nutmeg was fine, but I think it needs more ginger and maybe even a bit of anise or fennel seed. It was easy to scoop the batter into tins using my Oxo Good Grips Medium Cookie Scoop. I slightly over-cooked the muffins, so next time I’ll bake for only 14 minutes. I bake in a counter-top convection oven. 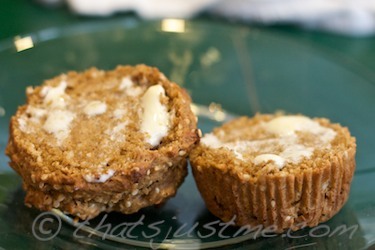 These muffins are not sweet, so more sweetener can be added if that is what you like. We plan on topping with a dollop of jelly for tomorrow’s breakfast! Raisins would be a great addition, as would some dark chocolate chips (leave out the spices). The sesame seeds are yummy! I might increase the amount added next time. 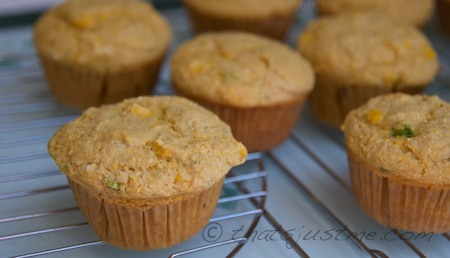 They add a touch of chewy sweetness to the muffin. Each muffin is approximately 2 oz. UPDATE: For breakfast, we ended up melting some organic whipped butter on top of a sliced muffin. It was yummy. I’ll definitely add a bit more sweetener next time, or possibly some sweeter mix-ins like raisins or chocolate chunks, along with a bit more sesame seeds.